At one point in this nation’s history journalism was an honorable and respected craft, or at least perceived in such as way. This perception embodied a sense of duty to the people, a dedication to the freedom of information and the people’s right to the truth. Yet, today the American people are seeing a complete loss of accountability within their once trusted media, or quite possibly, seeing for what it has been all along. 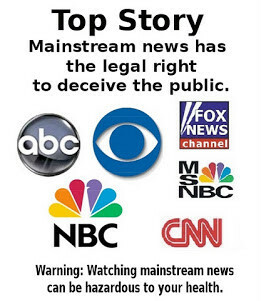 countless news outlets that can wildly claim unsubstantiated facts with no fear of reprisal — both alternative and mainstream media alike. Yet, many Americans will still read, believe and repost those very same articles nonetheless. So the sad truth is that most of the country is being misled about what is actually happening. A study conducted in Germany has rapidly circulated the internet and is a perfect example of this unfortunate and debilitating lack of accountability. It was published online in the journal, Forensic Science International. The study claims that two men died as a result of smoking marijuana. This is being proclaimed by prohibitionists as the verifiable proof that marijuana kills. At face value the story sounds shocking, and that is the desired effect. However, this is an absolute misrepresentation of the facts, if not an outright lie. The German study shows in the conclusion of each case that marijuana was simply the catalyst; the cause of death being an unknown preexisting heart condition in one case, and a history of alcohol, amphetamine and cocaine abuse in the other. The wording in the study can be confusing to the average person, containing many medical terms. With this in mind, many deceitful writers place the focus on the “acute influence of cannabis” that is listed after the true cause of death in each case. Some sites documented that the two men had preexisting conditions, however, they still continue to claim that marijuana was the cause of death. Why do these sites choose to manipulate the meaning of this study? It is because the average person will do one of two things: either skim the article, only retaining certain main points like “marijuana was the cause of death” or only read the title of the article which states, “Marijuana Kills” and spread that lie. This is clearly misleading. Some of the worst sites will go as far as to change the facts completely, otherwise called lying, and claim that there were no preexisting conditions and both men died as a result of smoking marijuana. This is morally and professionally wrong. These deceitful websites and unprofessional news stations are responsible in large part for this country’s decline. These proliferators of misinformation are keeping the electorate divided and ill-informed, therein hindering the very growth of this nation. Following the release of this study, and the continued skewing of the facts, the German Association for Drugs and Addiction (FDR), which is based in Hannover, released their statement criticizing the study claiming that it did not help educate people about the reality of the drug. Leune added that the dangers of marijuana were “exaggerated” and that it was less harmful than alcohol or tobacco. In the current journalistic and political state of this country, one has no other choice but to take whatever news is heard with a handful of salt. Today it is more accurate and informative to research and seek out the truth of each story for oneself. This country’s only defense against the current media’s fraudulent representation of the truth is to be well read, educated and skeptical. Take it upon yourself to know the truth. Take it upon yourself to spread that truth. Take it upon yourself to be the truth.